Basically, we take the forecast information for the afternoon including wind speed, temperatures as wind chill can be a factor when hanging out around the BBQ. 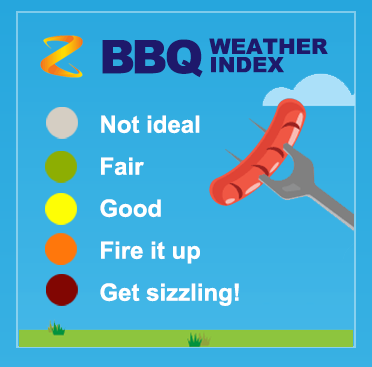 We also look at if there is cloud or any rainfall expected from midday to 6pm, as rain has be the biggest reason to cancel a BBQ (according to a survey of the meteorologists in the forecast room). If you get a ‘Get sizzling’, then it is forecast to be Fine or Part cloudy, with relatively light winds of about or less than 15km/h and temperatures greater than 20C. If you get a ‘Fire it up’, then the forecast is for Fine or Part cloudy, wind of less than 20km/h and/or a temperature greater than 15C. If you get a ‘Good’, there is probably Cloud in the forecast or Chance of a shower, with breezy wind, and/or cooler temperatures than is pleasent when sitting around the BBQ, with temperatures greater or less than 15C. If you get a 'Fair', the forecast will probably have Cloud in the forecast or a Chance of a Shower or two, with fresh winds and a chance of some stronger gusts, and/or temperature less than or equal to 15C. If you get a ‘Not ideal', it is because the forecast is Wet, wind of greater than 40km/h and/or a temperature less than 15C.